Living with a dog in a small apartment can be challenging. (New Yorkers are known for being professional tiny house dwellers.) Dog gear seems to reproduce overnight: more toys litter the floor, dog beds edge out your own furniture, food and water bowls migrate to the center of the floor. If you’ve ever stubbed your toe on a dog crate or knocked over a full bowl of water, you know what I’m talking about. 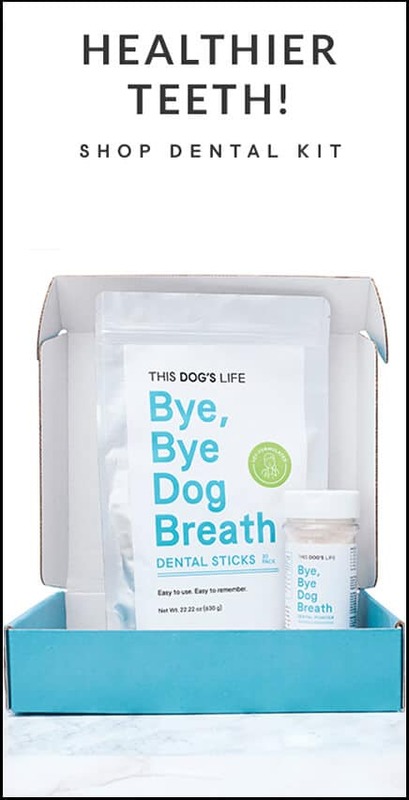 Instead of slowly donating everything you own so your dog can live in the style she’s accustomed to, try some of these great products and tips for people living in small spaces. 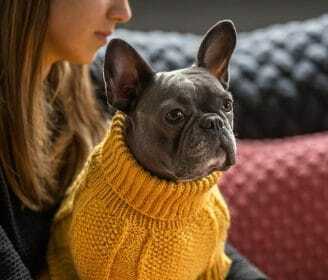 Treat your dogs to their own Connell Dog Sofa, and maybe they’ll actually stay off the furniture. 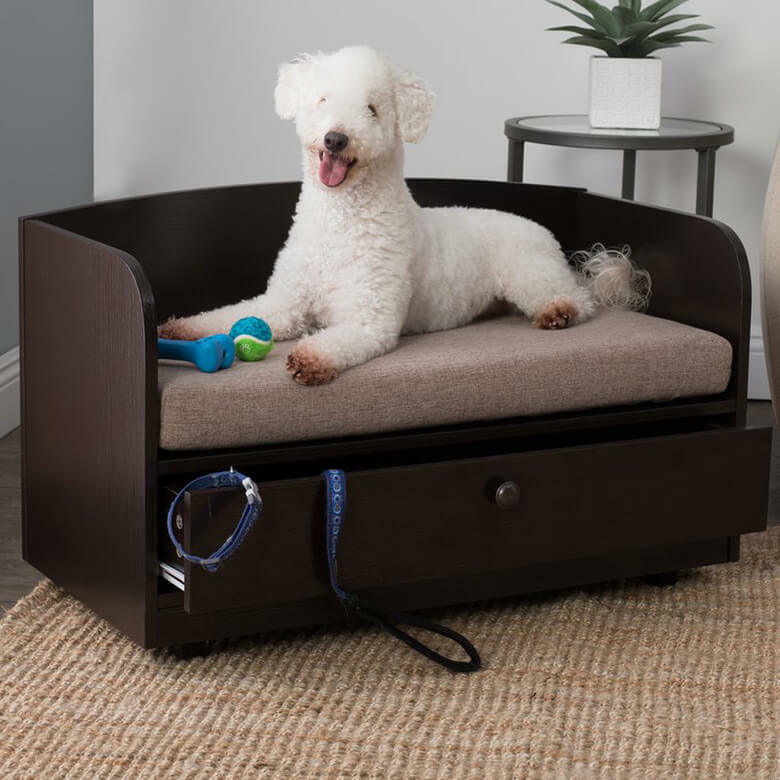 In expresso wood with a curved back, tapered legs and a linen-look covered cushion, the storage drawer is large enough to hold a lot of the gear currently strewn on your floor: toys, leashes, and anything else that you want out of sight. 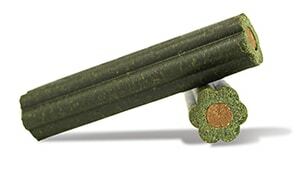 The contemporary, elegant design will actually enhance your interior design. 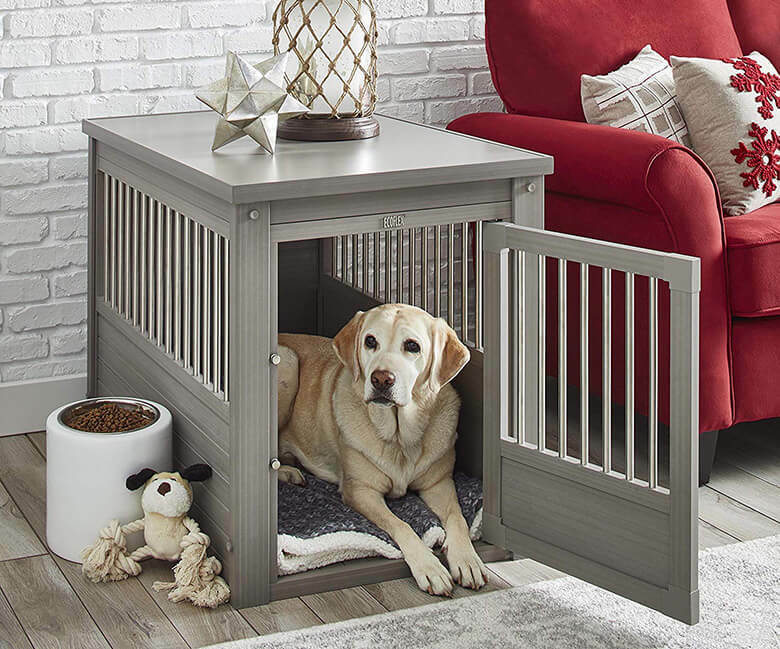 If your dog parks himself by the front door to wait for you to get home, the Lula Entryway Dog Bed is a great solution. Four hooks on the high back will hold leashes, collars, and your own jacket (if your dog allows you hang it on his hall tree). 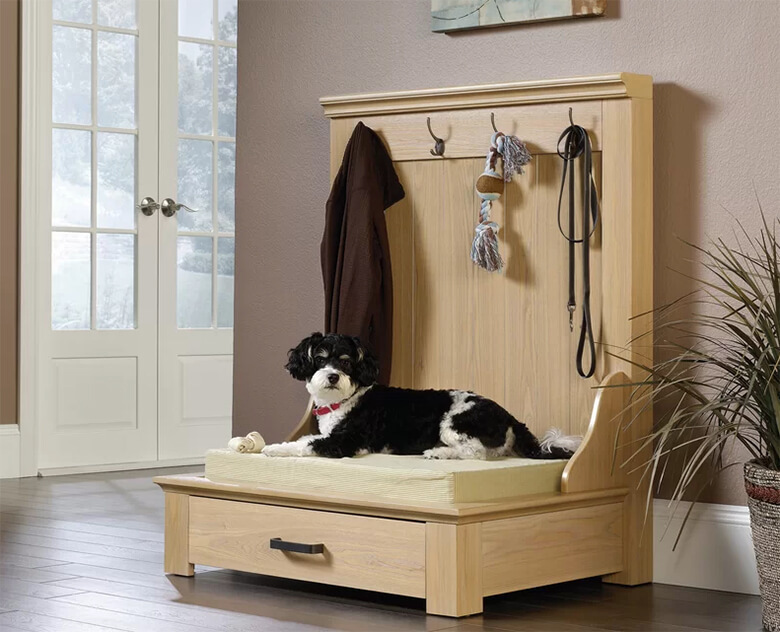 Down below, a memory foam dog bed tops a good-sized drawer for dog gear. 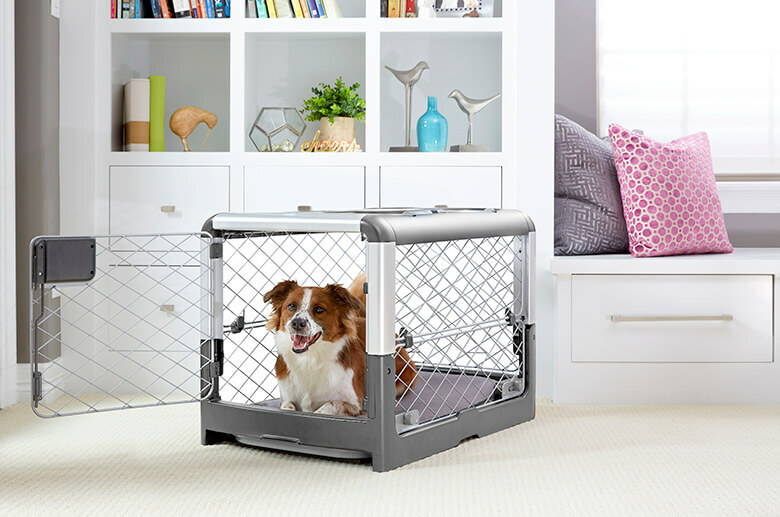 The Revolv Crate sets-up and collapses with one hand and folds flat for occasional use (please don’t leave your dog in a crate all day long) or for traveling. 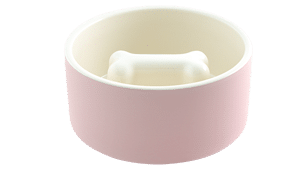 Made of reinforced plastic, high-strength steel mesh wire and high-quality aluminum, it will keep even aggressive chewers inside and safe. The diamond-shaped mesh pattern and solid, single-piece frame prevent injury to jaws and paws with a modern, industrial look. 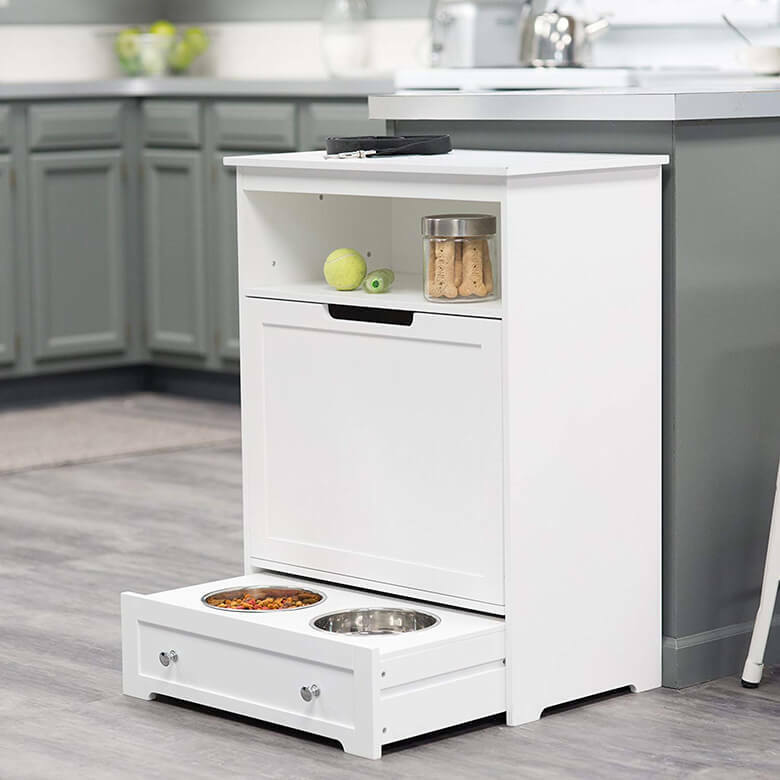 Pet feeding stations incorporate storage with pull-out water and food bowls. 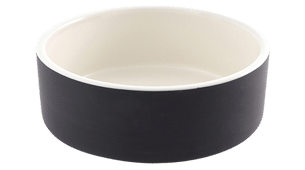 The Boomer & George gives also gives you an open shelf for treat jars, hooks on the side for gear, and the bottom pull out tray with inset stainless steel bowls. 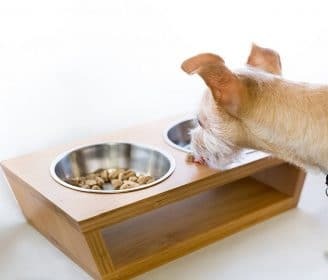 You can slide the tray in to keep bowls out of sight (but always provide a bowl of fresh water elsewhere). 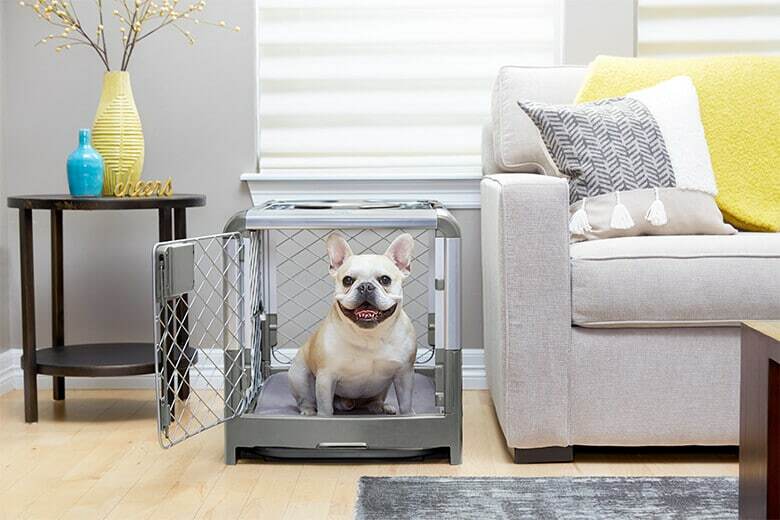 These beautiful dog crates double as end tables and look good doing it. 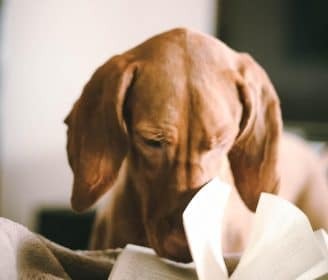 Your dog can lounge in the living room without getting dog hair on your sofa, and you can put your drink down on its top for easy reach (or a book, your glasses, a plant — go wild!). They come in every style from rustic and industrial to shabby chic and super modern. 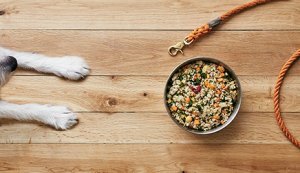 For those who don’t want to buy any products and instead would rather do a little bit of home improvement, here are some projects that will make your dog happy and save you some space. 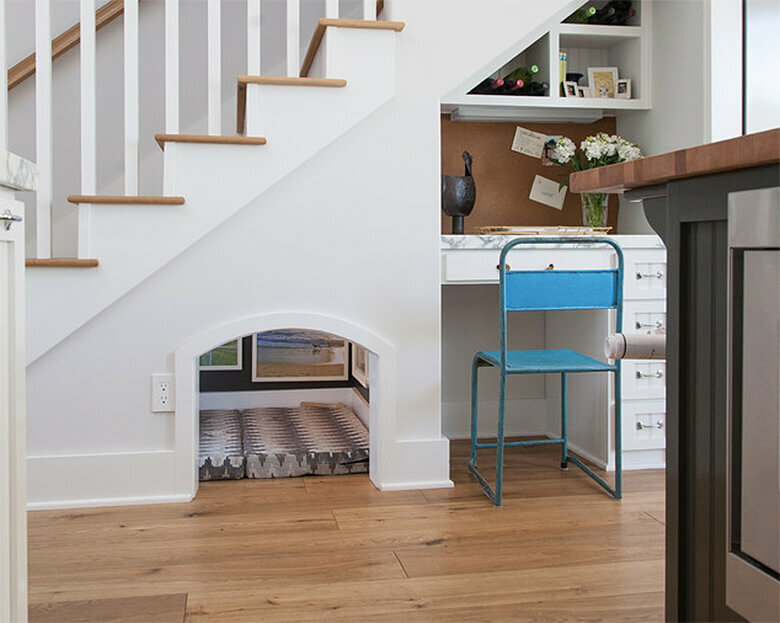 Interior design firm Betsy Bassett Interiors has a great example of creative ways to save space in your home while still proving your dog with a room to call her own: a doggie den built underneath a kitchen counter that actually looks beautiful. 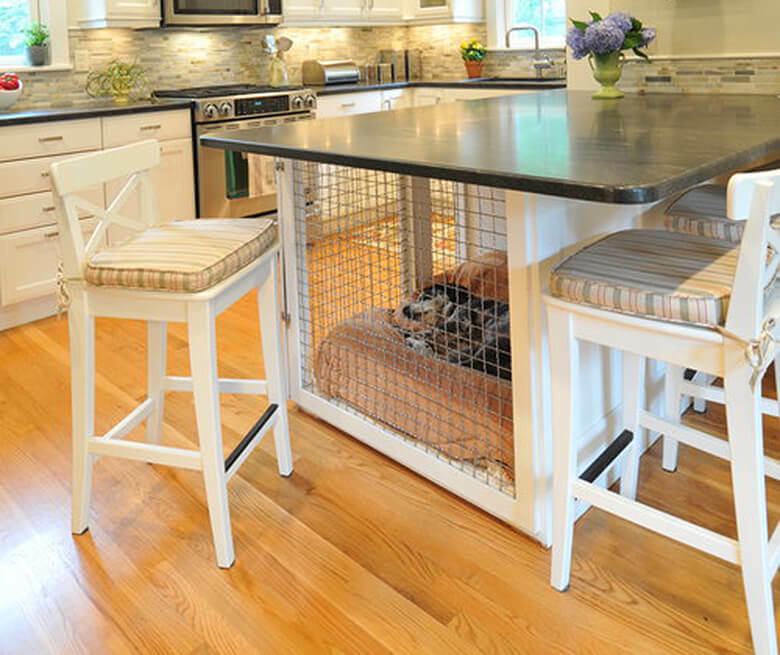 Custom designed to eliminate ugly crates in the home, the den/bed is integrated seamlessly into the transitional design of the kitchen. For more ideas, check out this page on Pinterest. Calling all canine art lovers! 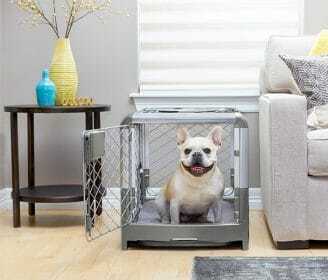 Your dogs can have their own hideaway den with this ingenious design. Tucked into the space beneath the stairs, it’s a great idea if you have a small duplex or a loft bed. Inside, there’s a comfy dog bed, and the owner even crawled in and put some art on the walls for his obviously discerning canine culture-maven. 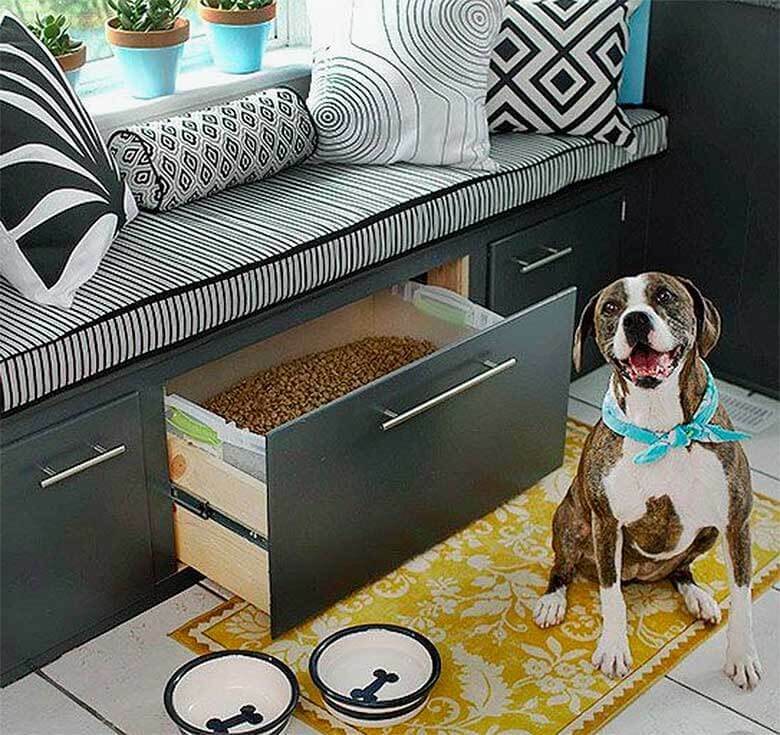 Turn a window seat/dog bed into a storage solution for toys and gear by building or buying a unit with large, deep drawers (if you do use it to store dog food, keep it in the original resealable bag). 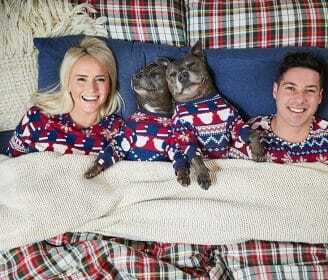 If you build it from scratch (or have someone else build it), you can tailor it to your dog’s needs. Or measure carefully and buy a storage bench. 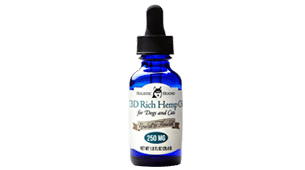 Your dog might even let you sit there is you’re really good. 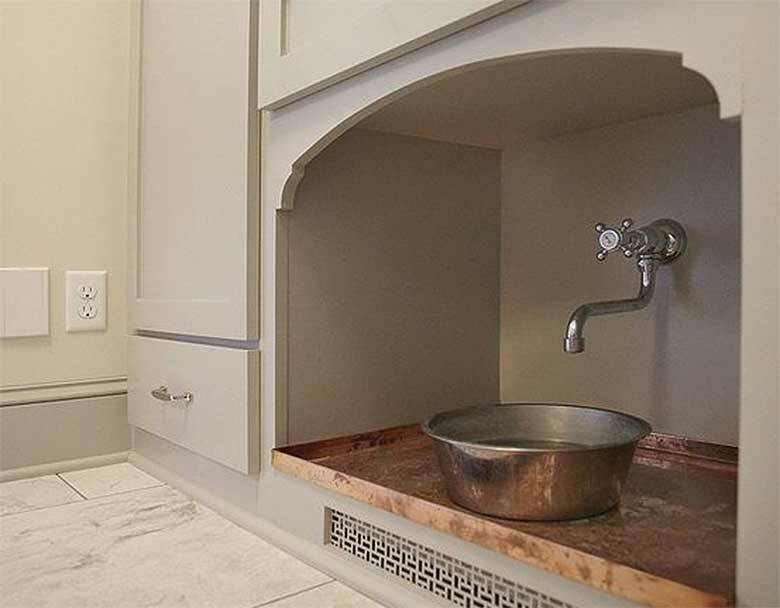 Assuming you have enough storage in your kitchen for, you know, human stuff, this under sink watering station tucks away the water bowl so you don’t constantly kick it over (I know this happens to you too!). 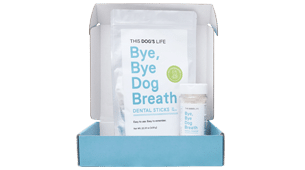 It also makes it fast and handy to frequently refresh the water, which is healthier for dogs than water that’s been standing for a day or two. 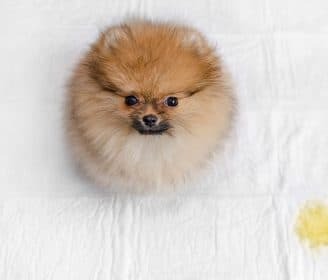 Just remember to wash your water bowls often.